Tying the stuffed pig's foot. 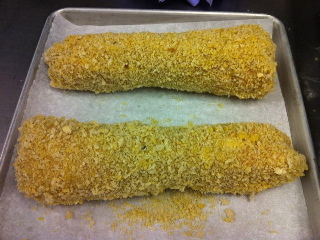 Pig's foot rolled in bread crumbs, ready to be sauteed. 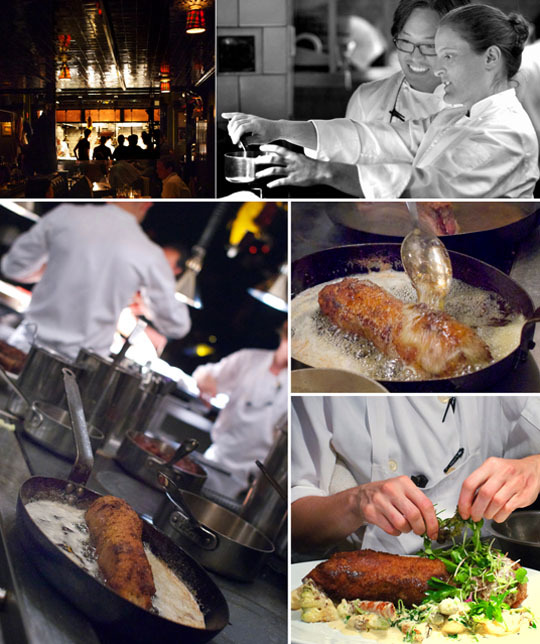 April Bloomfield, The English Chef Taking Manhattan by Storm from the Guardian UK or this New Yorker profile. Wow, this looks amazing. 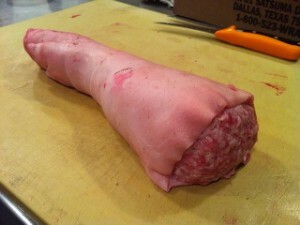 My family bought a pig on the hoof a couple of months ago and processed, butchered, and cured it ourselves. I wanted to keep the trotters, but my husband and I couldn’t figure out how to clean them. They were not the beautiful looking, cleaned trotters in your photos. After struggling with them for what felt like hours, we gave up and threw them out. Any thoughts on resources for how to do this? By the way, my copy of Charcuterie was invaluable. It has about 30 bookmarks in it and everything we made (bacon, sausages, hams, guanciale) came out perfectly. Thanks for such a great book, you rock! I keep pigs trotters in the freezer. I often use them to deepen the flavour of stocks and to add gelatin. I just throw them in frozen. Peter says they get them fairly clean like that but sometimes use a razor to remove remaining bristles. they don’t do anything to the nails. I don’t think I have the skill to do this myself, but I do have the means to get to NYC and go to the Breslin and order one. I’ll be dreaming of this until then. I’ll have to give this a try come hog butcherin’ time this autumn. 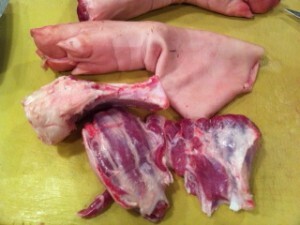 Meanwhile, I’ve got some small split trotters curing for smoked stuffed trotters for this month’s challenge. For Pieds de Cochon Farcis, I debone to the first joint. Is there a special reason why they don’t go that far? I have a friend with pig feet, and I said I’d help her. Neither of us have been able to find information on removing the hair, and whether or not the toenails stay on. Any suggestions? Pour hot water over the feet and remove the hairs by scraping with a knife. We tried that and didn’t have much luck. How hot? You can also use a blow torch to remove all excess hair. Just make sure not to char the skin to much. 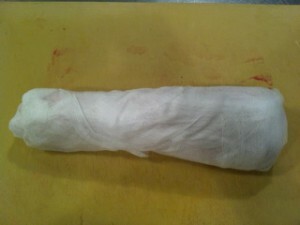 My reservation stems from the deboning process; how exactly is the skin removed from the meat without any skin tearing? Little by little, like rolling off a sock? Or is the entire blade of the knife inserted longitudinally into the subcutaneous fat and then worked around the entire shank? a little bit of both, have to be careful. That seems like a lot of work for a meal. Well I hope you chefs out there take notes and might consider putting it on your menus so many of us can try it. Mr Ruhlman, how much do you pay for pig shanks ? I’d think they’d be pretty cheap . Maybe if they get real popular, they can rise in price like the wing. Last time I checked, the wings were outrageously priced. But I guess that’s because flying pigs are so rare. 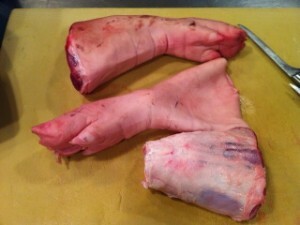 Grew up with pigs feet being prepared at home. Not near as elegantly as this but there is still no way to change the fact that it is a pigs foot. Sorry, as beautiful as it is, I won’t be making the leap. I wonder how it will taste with some the local cajun Andouiile? Brilliant! I helped Ryan from http://www.nosetotailathome.com cook a very similar dish a when he was doing his 24hour cooking ( from Fergus Henderson’s books ) marathon. 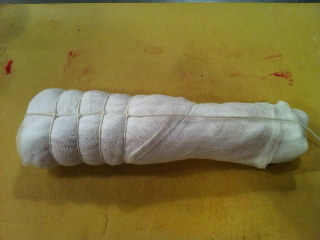 We boned the long foot, braised it, stuffed it with a potato mix and wrapped it in caulfat and browned it off. Was actually quite simple, but very time consuming, especially trying to tunnel bone them. oh … and it was magnificent to eat! the latter. you can actually cut the skin lengthways and split it open, especially if you have some meatglue or some caulfat to close it back up. We tried both ways, and tunnel boned out looked a bit better, but the taste was the same. 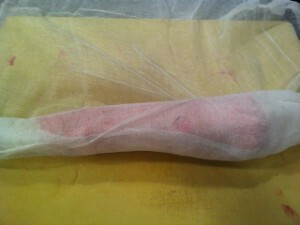 to tunnel bone we basically cut around the bone, rolled the skin, cut a bit more, rolled the skin etc. the joints took a bit of work to seperate and get bones out, but it wasn’t too bad. That’s a great post out of context. That is funny! Not sure whether to suggest a doctor or a veterinarian. Back to the topic: I went to a hog butchering demo recently and the butcher used a blowtorch. Don’t bother with those overpriced, underpowered toys they sell in kitchen supply stores. Just go to a hardware store where you can get a good one for under thirty dollars. It’s amazing how many different culinary and household tasks you can think of to use a blowtorch on. when pigs are slaughtered they’re often dunked in hot water and then scraped with special scrapers to remove bristles, remaining bristles are torched off. That is what we did, but it was really tricky with the trotters because they are bumpy. We’ll just try harder next time! I had the stuffed pied de cochon with foie gras at Picard’s restaurant (http://blog.belm.com/2009/08/19/au-pied-de-cochon/); it was mind-blowing. I bought his cookbook with the intent of making the recipe at home, but the method wasn’t very clear (requiring “boxing bandages” to wrap the stuffed leg before a sous vide immersion). April’s recipe clarifies all of the questionable steps. It’s time to exhume the two huge pig legs from my deep freezer and get to work! Agreed. You can put toenail polish on a pig, but it’s still just pigs’ feet. I’d rather smoke ’em for greens. Agreed. Nothing better than a smoked hock to make everything taste better! This looks lovely, especially since my source of cotechino has left the island. I do have one question – is it usual to leave the toenails on the trotters? 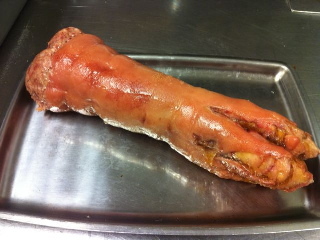 Not something I eat often but I had wonderful pig trotters at Chez Denise in Paris and I’m sure I would have noticed the presence of toenails. And I KNOW my daughter, who was about 10 at the time, would have had something to say. Really curious. The Bresin is great. My wife and I had brunch there with Pardus and Claudia. A very cool place. This post almost convinced me to try this! Is there a particular temp on the oil? I know cooking time/temp combinations will vary depending on process and size, but if you can find a ballpark temp of the oil to aim for it would soothe the neurotic baker in me. 350 degrees usually a good fry temp. will try to join in on the comments later today, got unexpectedly busy yesterday! I am curious about the poaching for 4 – 5 hours – I’d like to sous vide instead just because I have one now! How long do you think it would take and at what temperature? 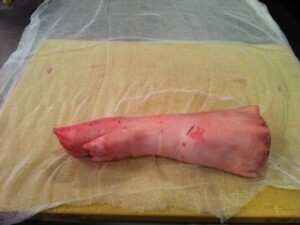 My husband ate pickled pigs feet growing up and I think I will surprise him with this. 140 F/60 C for 48 hours, perfect, and though i’ve never tried it, you probably have an 8 hour window on either end, but plan on longer rather than shorter. I split this dish with my brother-in-law just 7 nights ago, prior to going to a show at MSG. The concept and the presentation I loved, but I must admit that the spices in the farce, specifically cinnamon (I think?) were so overwhelming at times as to make the dish a bit too Christmasy at times. All in all, I enjoyed it, and the brussels sprouts & sauce were fantastic. I would certainly be interested in one of the other seasonal preparations of the trotters. Could you slice the chilled foot into burger sized rounds? then bread and fry those? absolutely! that’s kind of how the trotter is done at bouchon. Wow! This reminds me of my mother. She used to make something similar with pork legs. She likes to stuff all kinds of things — milkfish, frogs, pork chops, chicken legs, crab, bitter melon, squid — I can go on and on. She’s Filipino by the way.